Thanks to the academic exchange agreement signed by the National Institute of Japanese Literature and the Department of Asian Studies, we will be hosting a workshop on September 26 on “Heian Literature as Seen in Translation” and “The Grammatology of Kanji and Kana” (2:00 pm-5:00 pm). Please join us for this event, which will be conducted in Japanese, plus book launches preceding and following the workshop, conducted in English. All three events will take place in room 604, Asian Centre, 1871 West Mall, UBC. Based on his recent book of the same title (Brill, 2014), Professor Duthie will discuss how the Man’yōshū (Collection of a Myriad Ages, eighth century) portrays the early Japanese court as a realm of “all under heaven.” The Yamato court represented itself as an imperial realm through the ritual organization of cultural knowledge around the figure of the emperor. Such a conception of knowledge assumed a continuum between a broad ideal of literate practice that ranged from the basic tasks of government administration—the writing of laws, the registering of lands and population, and the recording of taxes—to a self-consciously belletristic tradition of vernacular poetry in which the Yamato courtiers could participate and recognize themselves as the cultured officials of the new imperial realm. 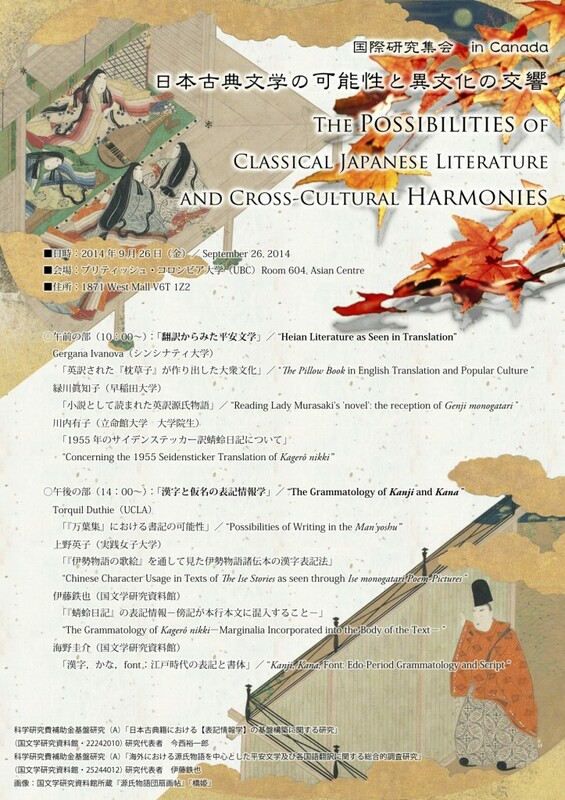 The talk will examine the various ways in which the different volumes of the Man’yōshū are configured as an imperial collection, and how certain exemplary poems in the first two volumes negotiate the collective memories and aspirations of the imperial court in expressions of praise for reigning sovereigns, mourning for deceased crown princes, and journeys through the newly defined imperial landscape. Professor Duthie will conclude with an examination of a poem written in the voice of a man mourning his deceased wife, and a discussion of how the collecting of such poems in the anthology functions to represent a universal realm of courtly emotion centered on the figure of the emperor. Professor Arntzen will present on her new translation of Sarashina nikki, produced collaboratively with Professor Moriyuki Itō. The Sarashina Diary: A Woman’s Life in Eleventh-Century Japan (Columbia University Press, 2014) recounts the life of Japanese noblewoman over a forty-year period, offers a portrait of the writer as reader, and explores the power of reading to shape one’s expectations and aspirations. Professor Arntzen will discuss the text and author, and the innovative translation process that led to this book.